NICOLE RICHIE NEWS: Harlow Madden and Max Liron double birthday party!? Harlow Madden and Max Liron double birthday party!? Numerous websites are speculating that Nicole Richie's daughter - Harlow and Christina Aguilera's son - Max had a joint first birthday party together last Saturday. Christina Aguilera and Jordan Bratman, invited 40 guests to their Beverly Hills home on Saturday (17.01.09) to celebrate the first birthdays of their son Max Liron and Harlow Winter Kate, Nicole and Good Charlotte rocker Joel Madden's daughter. Max was born on 12 January 2008, the day after Nicole gave birth to Harlow. A source said: "The party was inspired by the children's book 'Where The Wild Things Are', so Christina and Jordan got people dressed as the characters to come along and surprise the kids. 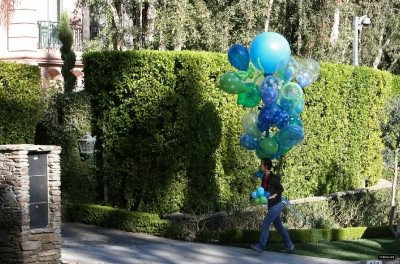 "Everyone was out in the garden, which had multi-coloured balloons tied to all the tress and looked great. All the guests had a wonderful time, and Max and Harlow loved the attention." Sounds like an amazing first birthday party & they had lots of great balloons! !